Articles and discussions on arts and culture. Yudhistir and his brothers seek blessings from Bhisma. 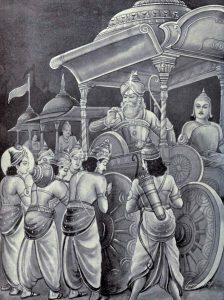 After Krishna returns with Arjuna to the Panadava formation, Yudhistir dismounts from his chariot and walks towards the Kaurava army to seek blessings from his gurus. Bhisma, Dron, Kripa, and Salya wish them victory. Then, with the blowing of the conch shells, the battle begins. The Pandavas and the Kauravas clash with all their might. Bhisma, Salya cause havoc in the Pandava enemy. The day ends in favor of the Kauravas with the Pandavas suffering severe losses including two of their top generals. 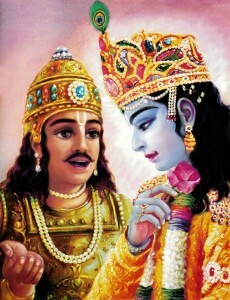 Arjun listens to the enlightening words from Krishna. 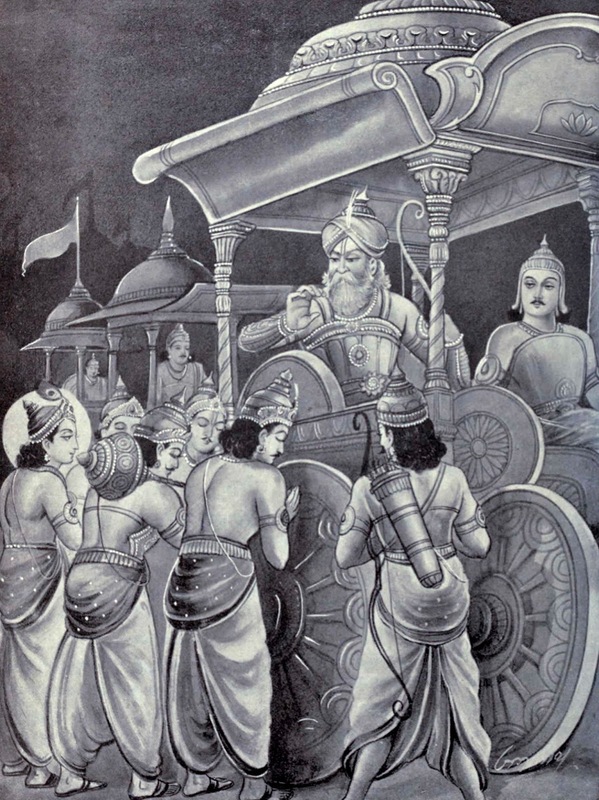 On the first day of the war, Krishna drives Arjuna’s chariot to the middle of the battlefield of Kurukshetra. 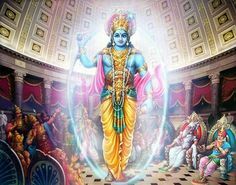 Watching Bhishma, Drona, Kripa and many of his relatives and friends assembled on the Kaurava side as his opponent, Arjuna is struck by an overwhelming sense of grief and despair. How could he kill the people whom he had loved, respected and grew up with? 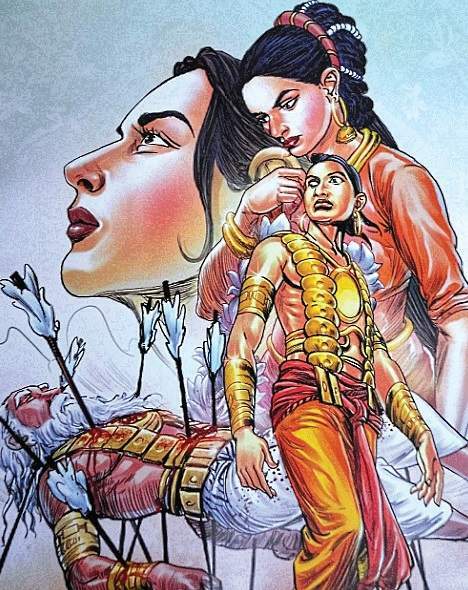 Arjun felt his strength being sapped off his body. He puts down his bow and declines to fight. 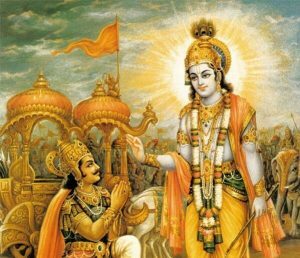 Krishna then enlightens and inspires Arjuna with great words of wisdom that is now known to the world as the Bhagabad Gita. Listen to this great episode by clicking the player below. 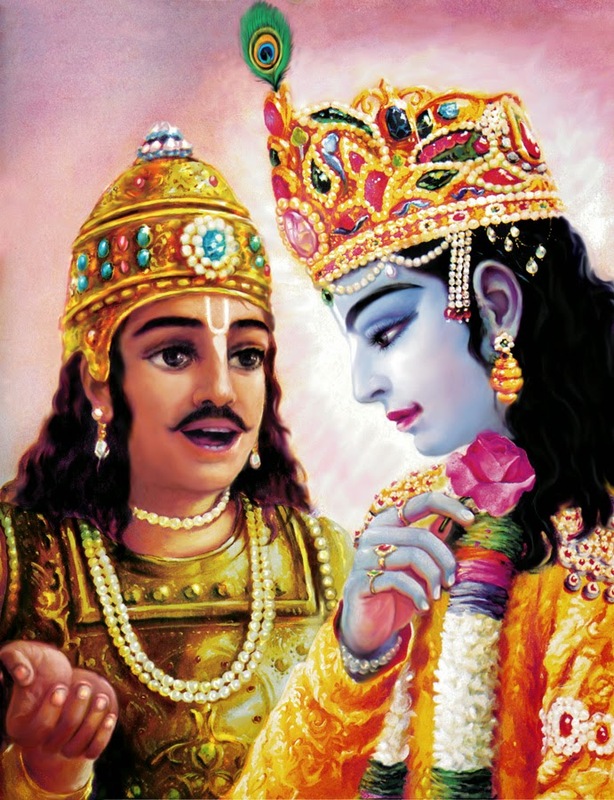 Vyasa gives Sanjay the power of distant vision. The huge armies of the Kauravas and the Pandavas assemble on the battlefield of Kurukshetra. Bhisma vows to kill 10,000 Pandava soldiers a day. Arjun assures Yudhistir of victory. The Kaurava and the Pandava generals meet and decide on the rules of engagement. 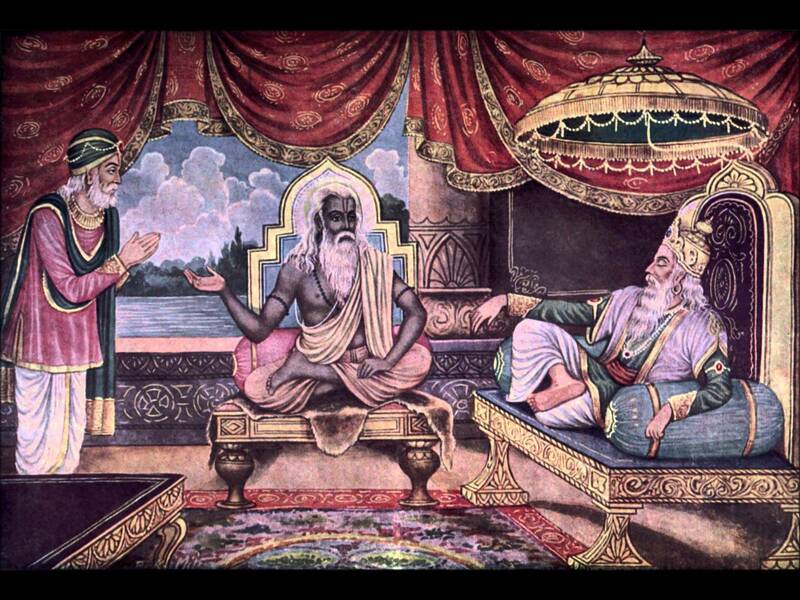 Rishi Vyasa visits Dhritarashtra and gives Sanjaya the special power of distant vision, enabling him to watch the battle from the palace of Hastinapur and narrate the details to the blind king. Just before the battle begins, Arjun asks Krishna to take his chariot to the middle of the battlefield so that he could see whom he’d have to kill in this battle. The war of Kurukshetra is imminent. The Kauravas and the Pandavas prepare to engage in the battlefield. 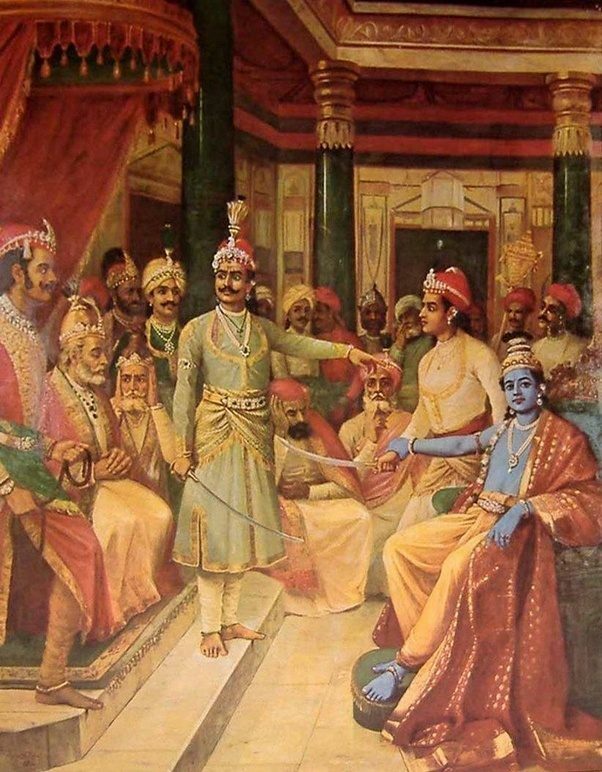 The day before the war, the Kaurava generals meet to formulate their strategy. Bhisma, tells Duryodhan and his men, that although he is obliged to fight the war on behalf of the throne, he has some conditions of his own. And one of these conditions is that he’d never fight Sikhandi, the son of King Drupad. 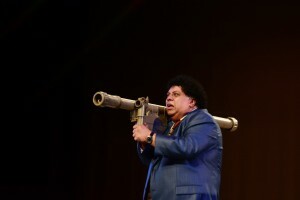 If Sikhandi ever attacked him, he’d put down his bow and accept whatever weapon SIkhandi hurls at him. Curious, Duryodhan asks why he’d impose such an odd condition. 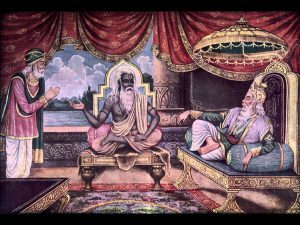 Bhishma then narrates the tale of Sikhandi and explains why he took such a vow. Click the link below and listen to the amazing tale of Sikhandi. With the war looming large, Kunti is scared for her sons. Although the Pandava brothers are strong and powerful, they are not invincible. The Kauravas have great warriors like Bhishma, Dron, Kripa and Karna, and with their combined might, they have the capability of destroying the Pandavas. And of all the Kaurava warriors, Karna is the most dangerous. With his superiors skills and a wide range of powerful weapons at his disposal, Karna alone can destroy hers sons, thought Kunti. Besides, Karna has made it his mission to kill Arjun. Kunti thought, the only way to stop Karna might be to reveal his true identity. 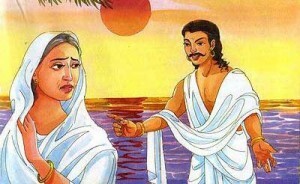 Kunti decides to pay Karna a visit. To know the outcome of this meeting, listen to the episode by clicking the link below. After failing to negotiate a peace deal with the Kauravas, Krishna tries a different route. He knew, if by some means he could convince Karna to switch his allegiance to the Pandavas, Duryodhan would give up his ambition to win the battle and hence the throne of Hastinapur. With this motive in mind, Krishna visits Karna and reveals Karna’s true identity. Krishna then asks an overwhelmed Karna to join the Pandavas and thus prevent the impending war. Karna is tempted but his loyalty to Duryodhan takes precedence in his decision making. 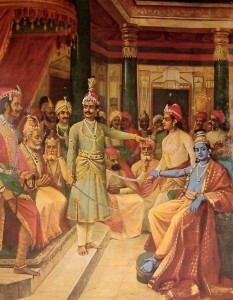 Krishna arrives at the Hastinapur palace with his peace proposal. However, his reconciliatory words falls into deaf ears. Duryodhan ignores Krishna’s proposal and claims he has done nothing wrong. Dhritarashtra makes a feeble attempt to convince Duryodhan, but fails. Duryodhan and his brothers try to attack Krishna and imprison him. However, Duryodhan was not prepared for the shock he was about to experience. Listen to this exciting episode by clicking the player below. The Why and How of “The Curious Case of a Casual Terrorist”. The Kauravas and the Pandavas prepare for war while the diplomatic efforts to avoid it takes its own course. Dhritarashtra sends his trusted emissary Sanjay to dissuade the Pandavas from a bloody war. 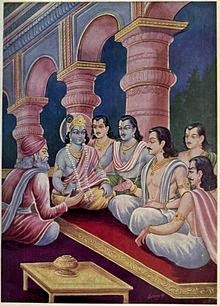 Yudhistir asks for five small villages for the five brothers. Duryodhan denies the request and declares. without a fight he wouldn’t give the Pandavas even a spec of land one could lift on a needle tip. Listen to this dramatic episode by clicking the player below.